The community college landscape is changing rapidly. Driven by a combination of increasing accountability and declining state funding, community colleges are being forced to rethink and redesign the way they do business: how to cost-effectively increase graduation rates; how to build urgency among faculty to reinvent systems of teaching and learning; and how to align their programs with those at institutions where students may transfer and with a changing job market. At the same time, community colleges are facing unprecedented demand from students who have historically entered college underprepared and graduated only infrequently, particularly minority, low-income and first-generation students. To respond to pressures to improve student outcomes while maintaining broad access, community colleges must deliver more credentials of higher quality at a lower per-student cost to an increasingly diverse population. Scaled, sustainable reform such as this requires exceptional leaders at a time when there is a huge turnover in senior leadership in the nation’s community colleges. 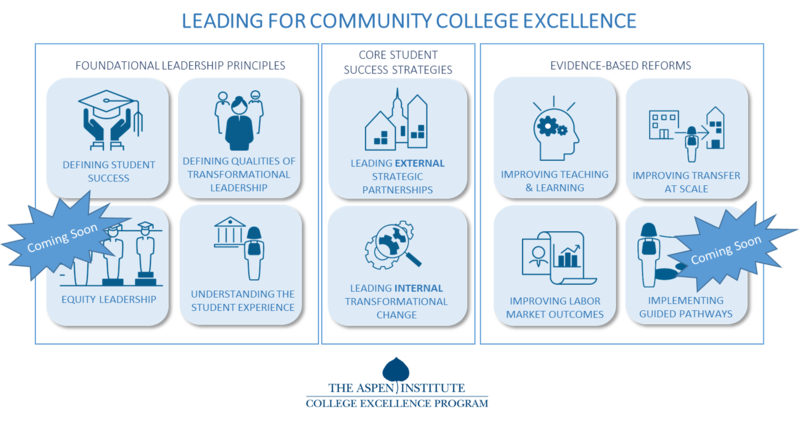 To respond to this challenge, the College Excellence Program at the Aspen Institute has created Leading for Community College Excellence, a set of curricular resources complete with case studies, videos, discussion questions, and recommended activities designed to help existing graduate education and community college professional development programs produce exceptional leaders who can improve student success. Evidence-based student success reforms designed to improve transfer at scale, improve teaching and learning, and align programs with the labor market. The development of these curricular resources was made possible by generous support from AACC Pathways, the Kresge Foundation, and Lumina Foundation.